Some of my favorite memories are of hearing a popular song for the first time. Take Prince’s “When Doves Cry”, for instance. It was the summer of 1984. I was 14, living in a small town in South Carolina. I was doing yard work for a neighbor down the street. It was a beautiful summer day. I was wearing a Walkman clipped to my belt, tuned to a pop station out of Columbia, the little black foam headphones over my ears. As I walked towards the street carrying a cardboard box full of clippings to dump on the curb, the song started: out of nowhere, all by itself, an electric guitar started pealing off that ripping torrent of notes; followed soon thereafter by that drum machine pattern with the weird, pulsing kick drum; then a strange, filtered, moaning vocal sound; and finally those minimalist syncopated keyboards. Right around the point where Prince started singing, I sat down, involuntarily, right in the middle of the yard, with the sun shining on the green grass and on the leaves of the trees and on top of my head. I just plopped down on the ground with my box of clippings in my lap, and I listened to that song. I think my mouth was hanging open a little bit. For anyone who knows anything about the history of computers in music, the Linn LM-1 looms large. It was the first drum machine to use digital samples of real drums. It had individual analog outs for each sound, and each sound was individually tunable and mixable. 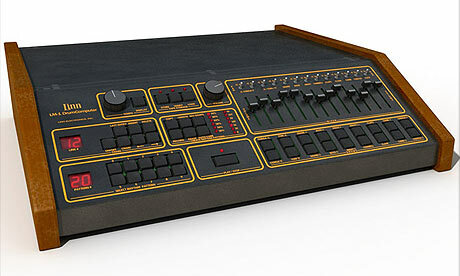 It also had a built-in digital sequencer, which included Roger Linn’s now-legendary “swing” function. And you could swap out the memory chips, for a price, giving the machine a whole new set of sounds. All of this was quite revolutionary, and very expensive: $4,995.00, or around $14,000.00 in today’s dollars. Only 500-700 were made, and they were quickly snapped up by leading names in the recording industry, artists and musicians and studio engineers with the money to spare on such cutting-edge gear. Prince used his LM-1 a lot back in those days, but “When Doves Cry” was singular. The sheer weirdness of the song is due in great part to the way he used the drum machine, sending the drum sounds (from their individual outputs, remember) through various guitar effects pedals on their way to the tape machine. The effect was one of pulsing, undulating cycles, round and round, with no release from the tension of the groove. Again, at the time that the first digital audio gear came to market, only wealthy people could afford it. And the wealthy people interested in such products tended to be musicians who had already enjoyed a measure of success, ones who were prone to adventurousness in their artistic pursuits: people like Prince, or Peter Gabriel. That’s Peter Gabriel during his time in the prog-rock band Genesis. He started wearing outlandish costumes because his singing couldn’t be heard above the band during their early gigs. He soon realized that the costumes helped to further the narrative preoccupations he was trying to address in his lyrics. Hey, it was the ’70s. The Fairlight CMI enjoyed a brief but beautiful (and influential) time in the musical sun. It was a full music workstation: it sampled, it synthesized, it sequenced, it even allowed you to alter the shape of waveforms by drawing on the screen with a “lightpen”. And it had a sound, a breathy, wispy quality that was, ironically, a side-effect of the programming the creators had done to deal with the limited processing power of the computer components available at the time. It cost $35,000.00 at the time (or $90,000.00, adjusted for inflation). That’s a lot of money. You can buy three cars for that kind of money. So, again, only wealthy artists could afford one. But listen to what they did with it: Peter Gabriel’s “Shock the Monkey”, Kate Bush’s “Hounds of Love”, Yes’ “Owner of a Lonely Heart” (hello, Trevor Horn). Something new and very exciting was happening in pop music. What you’re witnessing in the video is two of the most talented musicians in the world getting really excited about something technologically extraordinary, but something that only wealthy people like themselves had access to. Just a few years later, that basic technology would become much less expensive and rather commonplace, available at any local music shop. Today, you have only to open your laptop in order to have access to computer programs (and processing power) that make the LM-1 and the Fairlight seem quaint by comparison. The barriers to entry have fallen. And yet most people agree that pop music is not what is once was. This entry was posted in Culture, Music on August 6, 2013 by James McRay Johnson III.